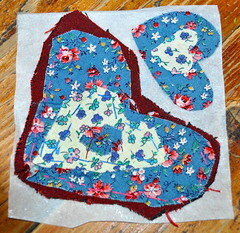 Scrap Heart: Because everyone needs something pretty. 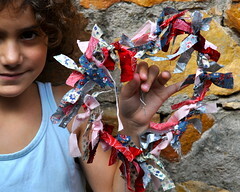 Make a heart shape out of florist wire (it is soft and bendy), cut fabric scraps into strips, tie them onto your heart frame, the more the merrier. 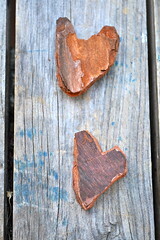 Bark Heart: Because everyone needs a little natural factual. Set my boys lose to carve some bark mulch from the garden. 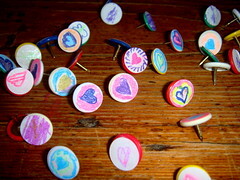 Patch Heart: Because we are so into patches right now. Follow the link to find out how we make our patches. 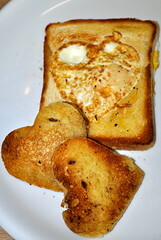 Egg Heart: Because everyone needs breakfast. Use a heart shaped cookie cutter to remove the middle of the bread and then pop an egg into the heart and fry it like a regular egg – just for fun – eggs in toast!!! 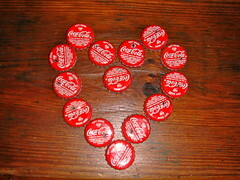 Sweet Heart: Because everyone needs a little sweetness. 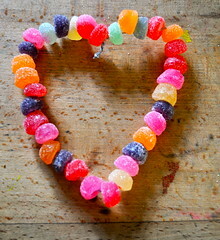 Thread your sweeties onto a wire heart. 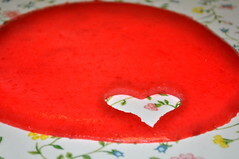 Jelly Heart: Because everyone needs a bite-size treat. 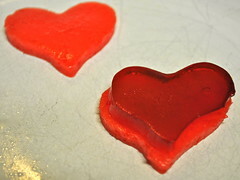 Make your jelly using half the recommended liquid then use a small cookie cutter to cut the hearts out and stack up different shades of jelly. 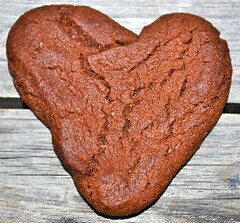 Cookie Heart: Because everyone needs a bit of chocolate. Cream 1/2 a cup of butter and 1/2 a cup of caramel brown sugar and 1/2 a cup of sticky brown sugar together. Add an egg to the mixture. Beat in a cup of self-raising flour (plain flour + 1 teaspoon of baking powder if you don’t have any). Finally, tip in a 100g of good quality melted chocolate and beat the mixture. Bake at 180 degrees for five to ten minutes. YUM. Se7en do Se7en Valentines… Se7en hearty crafts. 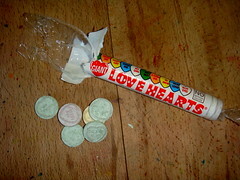 A Valentines Party in Se7en Steps… Hearty Games, Hearty snacks… just a hearty party. Saturday Spot: Groot Constantia and a Hearty Hunt… Scroll down for our hearty hunt after a disastrous Valentines Day!!! Sunday Snippet: Se7en Valentine Bible Games… Quick and easy, zero preparation hearty games. Sunday Snippet: Best Relationship Books Ever By Shaunti Feldhahn… Because Valentines Day is all about loving! That’s it – Have some hearty fun this weekend!!! Lovely fun. Happy Valentine’s Day. We’re not doing much this year because Chinese New Year falls on Feb. 14th. I don’t have much energy for much at all these days, but the kids don’t notice if things are simple or off the wall. They celebrate anyways! Hay JK, You will indeed have a lot to celebrate next weekend… and tell me can’t kids generate an occasion out of thin air!!! Luckily!!! You have a great and restful week!!! Hay J, Glad you like them!!! Have a fun weekend!! !